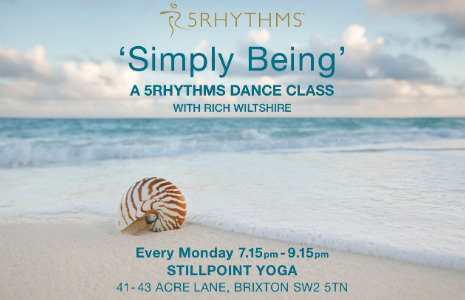 Simply Being is a new weekly 5Rhythms movement meditation class taking place taking place in Brixton at Still Point Yoga, every Monday evening at 7.15pm. Beginners are welcome! Simplicity is the guiding light for this 5Rhythms class. We can over-complicate life with stories that limit ourselves and our potential, keeping us small and disconnected from the world. This class is an invitation to show up and simply move with what's there no matter how you’re feeling. By exploring the 5Rhythms together in this way we will have the opportunity to move beyond our patterns into new depths of creativity and connection. 5Rhythms can be experienced by anyone regardless of their physical limitations. There are no specific moves to learn and dancers can participate at their own pace, within their own capacity to move. Simply bring yourself, some comfortable clothes to move in and something to keep you hydrated. I hope to see you there! Created by Gabrielle Roth and practiced by tens of thousands worldwide, 5Rhythms® is a philosophy, perspective, performance art and a dynamic movement practice rooted in the principle that if you put the psyche in motion it will heal itself. Movement is both the medicine and the metaphor, reaching across all languages, cultures and age groups to transform suffering into art, art into awareness and awareness into action. Wherever the 5 Rhythms are practiced, a community is born to dance, to sweat, the change, to support, and to provide a safe space for each of us to shatter the ego's hold and awaken the juicy, unpredictable, fascinating, edge walking, rock-star part of ourselves that yearns to be free.